Goji is a plant with delicious red berry fruits. These small but powerful berries contain the secret of longevity of the people from Tibet, the location of its origin. Goji berry is also called wolfberry, happy berry, red diamond, Lycium (Lycium barbarum). At the Himalayas, it has been used through the centuries not only as food, but also as a natural medicine. It can grow up to 1.5-2m. It blooms from May to the end of September, while the berries ripe successively from June to the end of October. Goji berry fruits can be consumed fresh or dried. Goji berry fruits are used for production of juice, syrup, tea, liquor, fruit yoghurt, and are is a commonly used additive in various cuisines, especially in the salads. Goji berry fruits are gaining popularity in the beginning of this century, when the results of the medical studies confirmed their beneficial effect for human health. US experts consider Goji berry fruits as the fruit of the century! There is not a single food supplement which prevents aging as goji berry! According to the US ORAC scale (Oxygen Radical Absorbance Capacity scale), goji is a superior first! 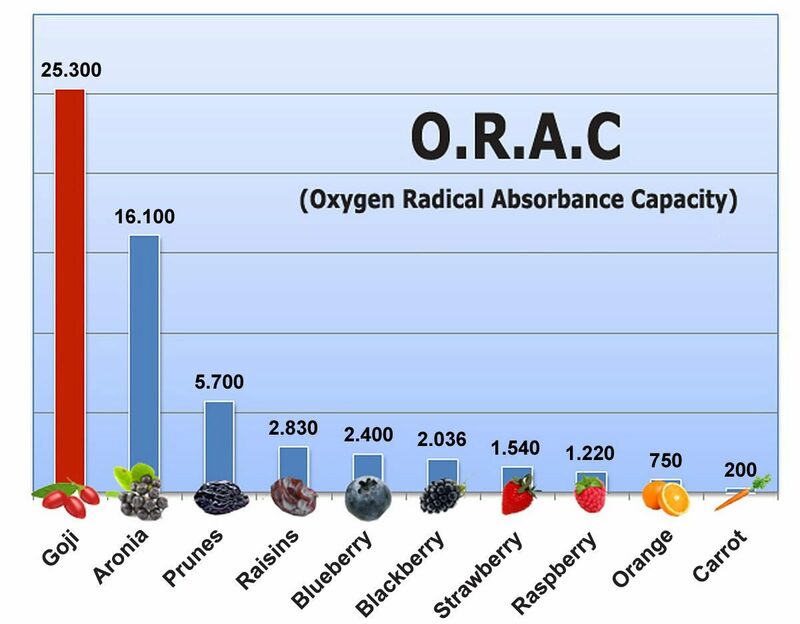 We should clarify that the higher ranking at the ORAC scale means higher ability of the food to destroy free radicals which have adverse effect on the health, cause chronic diseases and speed-up the aging process.